Hi! I’m Maciek from conie.co! We are an interior design studio that also specializes in architectural visualizations. The project I’ll describe below is a personal one – a tribute for the great design by Bernardo Bader. 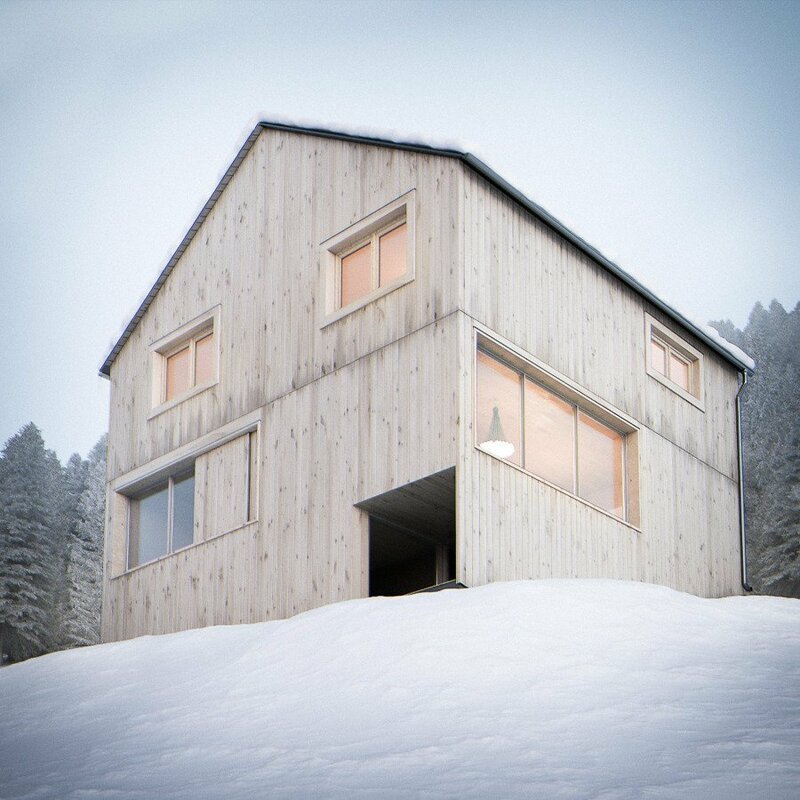 When I stumbled upon photos of stunning mountain house by Bernardo Bader I decided it would be a great exercise to recreate it in 3dsmax. Like every other project I started with collecting reference images and luckily I also found blueprints of the building and site. It allowed me to recreate it in 3d very accurately without need to worry about keeping correct proportions and dimensions. 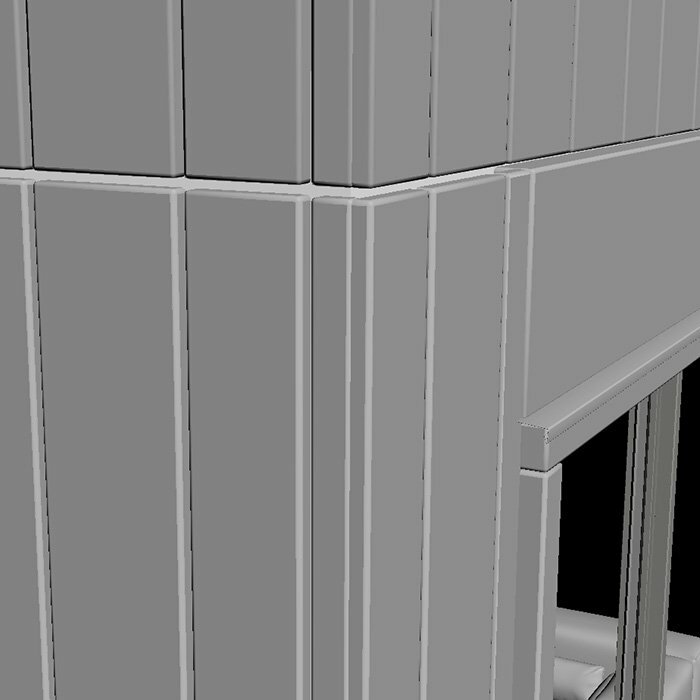 I already knew I was going to do many views of the house, so I started work with modelling the building. 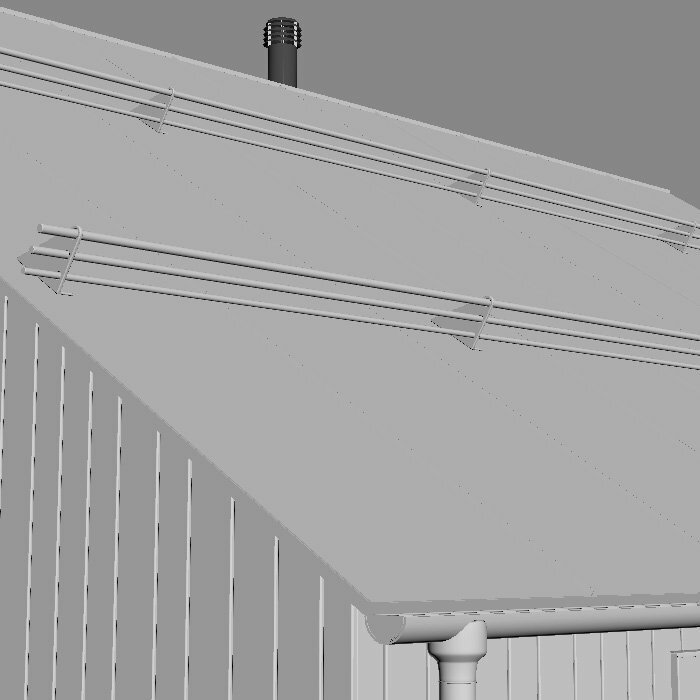 The base mesh was simple poly modelling, following the blueprints. After that I created boarding on the exterior walls. 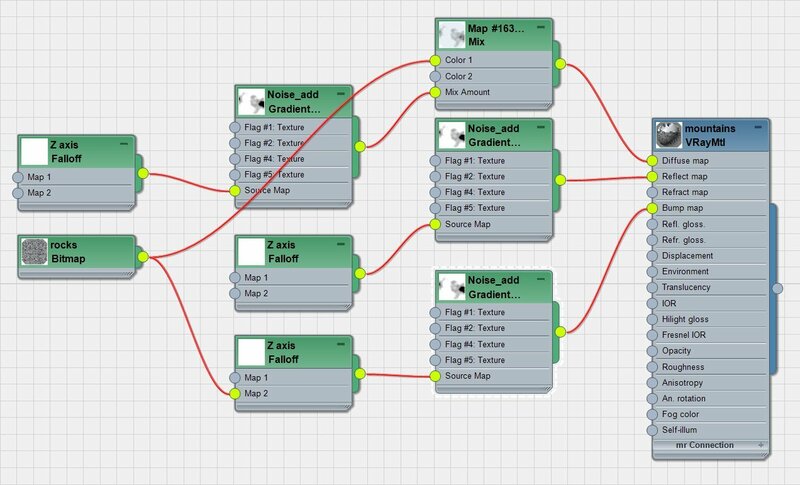 As you may suspect I used the great plugin from cg-source – floor generator. The process is very straightforward and was covered in many articles so I won’t explain it in depth. When all the walls were ready I created wooden framing around the windows and placed windows in place. 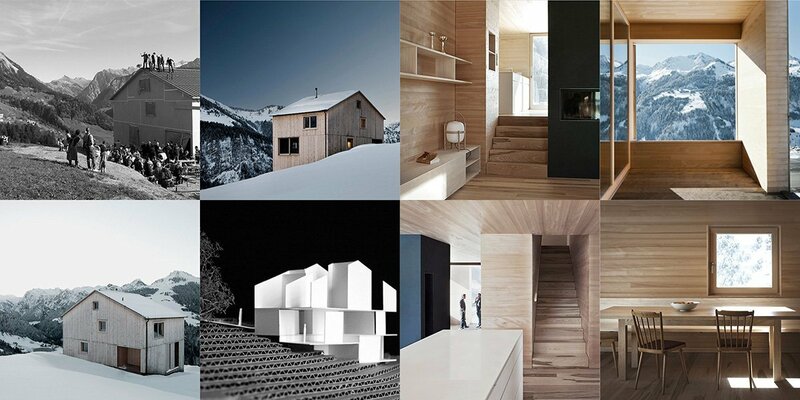 After that I focused on all important details – roof, drainage and interior prepositions. These small elements really add realism to the image. As you can see I also added some snow fences on roof. 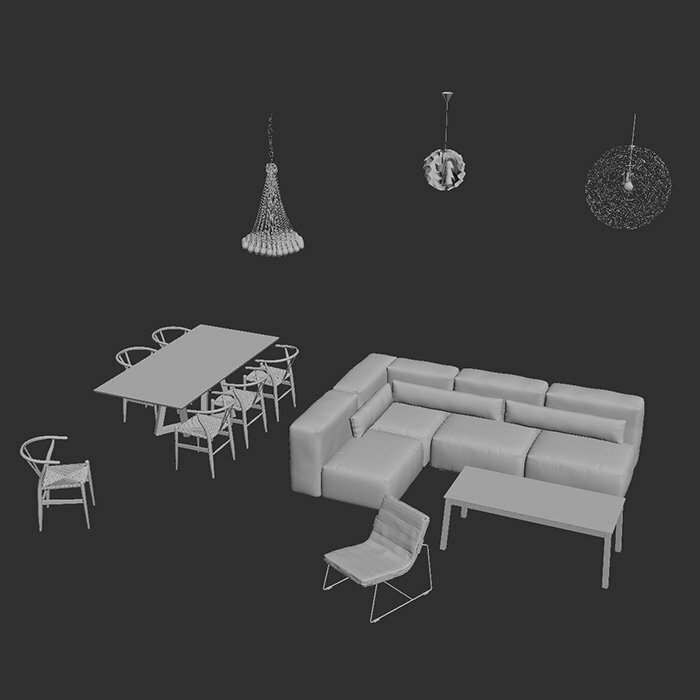 For interior I used some of models I made or used before. I just needed them to “crowd” the space a little bit. My next goal was adding snow to the roof. Since the roof is really simple I could do this with simply extruding roof faces, but I decided to try to do this with particle flow. The setup was quite obvious – particles were born above the roof (which was set as a deflector) and they fell and stuck to the roof on collision to form a thick layer. 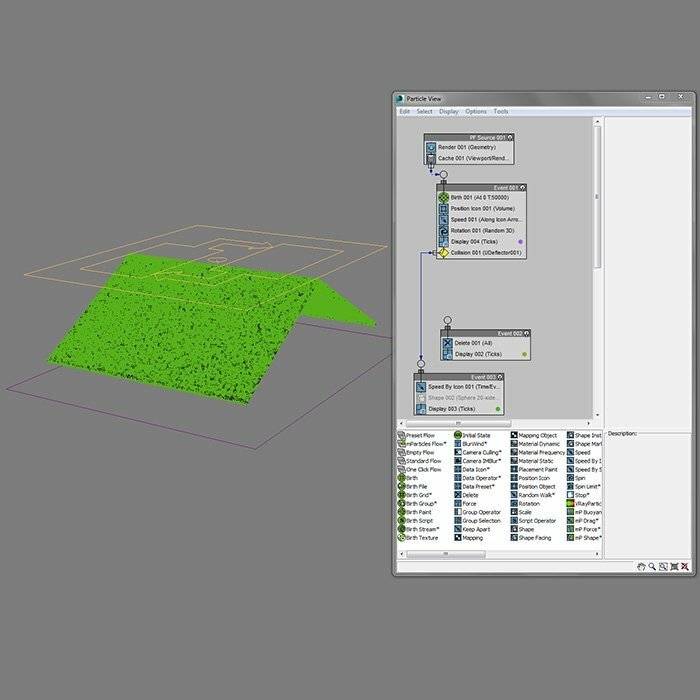 The resulting simulation was then meshed using 3dsmax blob mesh compound object. The result was fine, but I believe it could have been achieved with simple poly modelling in a fraction of time needed to set up and mesh particles. And of course it covered the snow fences I pedantically placed on the roof. I also added some icicles in appropriate places. Finally they turned out really good and gave nice touch to the image. At this point I created some basic materials for the building. I will show them later with materials for the environment in next part of this making of. Having completed the building I moved to the terrain/foliage part. 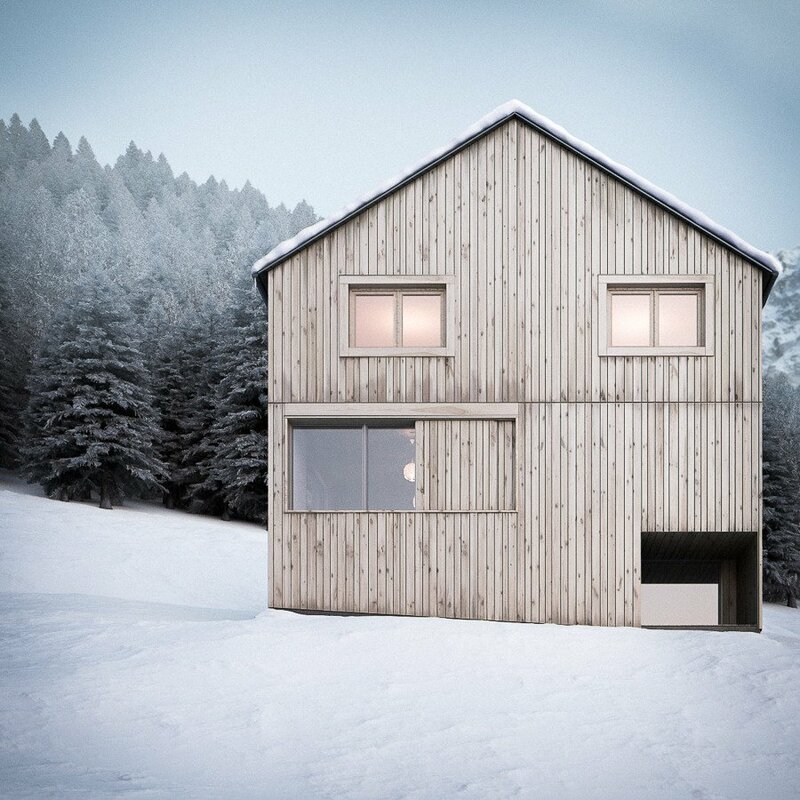 Since I had more or less the location of the site I imported via Sketchup the 3d terrain around Fontanella, Austria to a new file – I decided to Xref the building to keep the files smaller and simpler. The model of ground was really low poly, but it still gave some basic definition and let me set up cameras for different views. 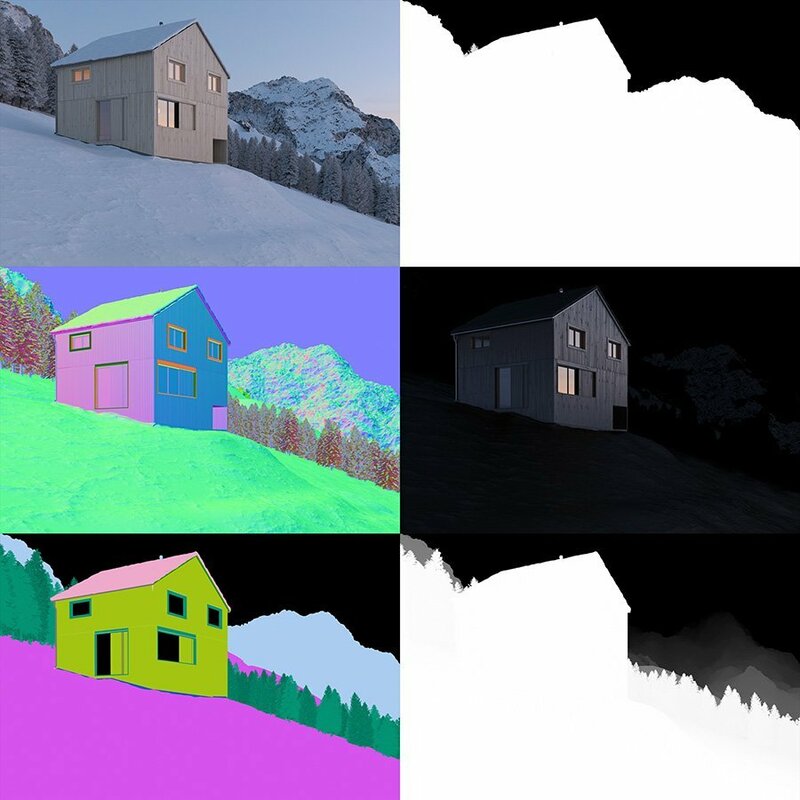 After I finished framing the shots, I split the terrain into few parts, depending how close they were to the house and/or cameras and subdivided them appropriately. At the beginning I thought I was going to use some of downloaded reference images as a background with high mountains, but I couldn’t find really satisfying pictures so I modeled 1 quasi-parametric mountain. It was made almost completely with both noise modifiers (with fractal mode on) and smoke/noise displacement maps. I made few copies of the mountain, each with some variation in rotation and scale. One more time I created some basic materials for the newly added parts of the project. For the forest I used Multiscatter plugin and previously prepared fir trees. I detached parts of terrain that were going to be covered in trees and used them as distribution objects for vegetation. The setup was very simple – I just set some variation in rotation and scale of the proxy meshes and picked suitable quantity of trees. 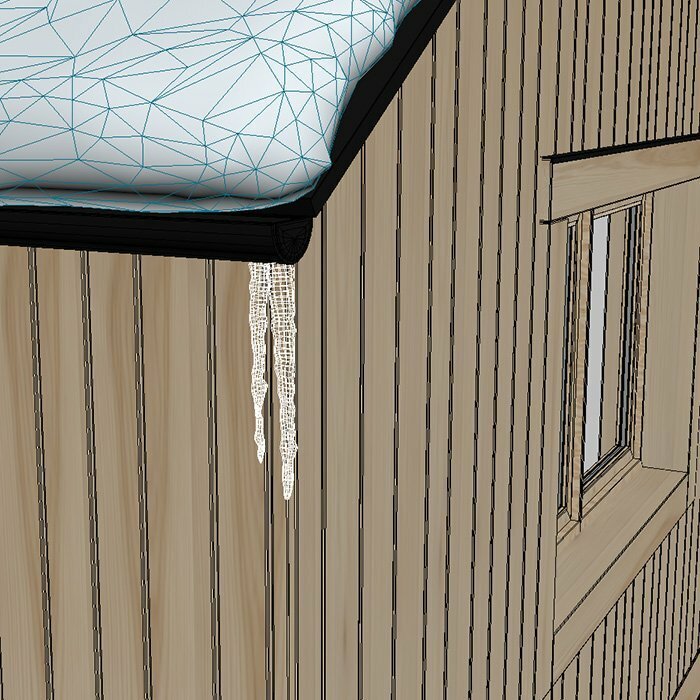 I used models from R&D Trees Vol 4 which were great, but not 100% accurate for winter environment. Since I needed snow covered trees I changed branches material in a similar way I made mountains material described below. I loaded a spherical map from VKNT.BJ into a dome light, via VRayHDRI loader. 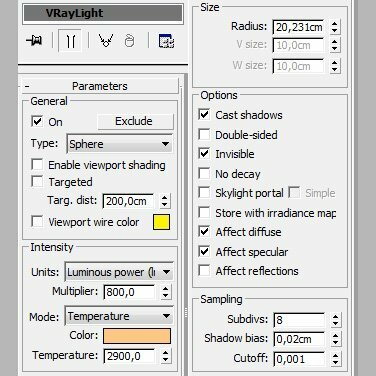 I prefer using spherical maps over “V-ray sun & sky” setup because of the subtle colour variations they give. It was especially important in the monochromatic environment I was going to have in the image. 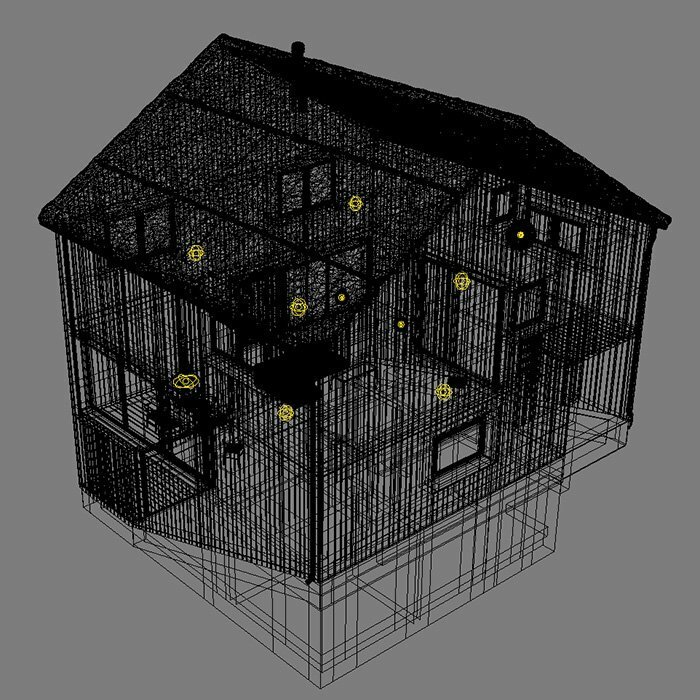 I also placed some Vray Sphere Lights inside the house, to simulate some artificial lighting. Each one of them was set to around 2700-3300K to give warm, cosy light. When all the lights were set and ready I started tweaking the materials. Firstly I deal with the base snow material, that was going to be used on far parts of image and on really small details like top parts of tree branches. I wanted it to be easy and fast to render so it’s simple blue-ish very light grey and a hint of glossy reflection. I tested many different options like VraySSS material or refraction + translucency but in this case they didn’t show any improvement in shading and kind of lost the fine displacement detail. So after many hours of region rendering I settled on this simple setup. Perhaps if I had used a more defined light sources – harsh sun and/or some outdoor lamps on the ground it would make sense to use SSS material. The foreground snow received hand painted displacement map – but it’s still that simple diffuse + glossy reflection material just as before. Here is a 100% crop from the painted map, showing the foot tracks. For the rendering I use LWF and Brute Force + Light Cache method. Since almost whole scene was lit directly by the dome light I could use fairly low settings and still come up with really smooth looking render. ZDepth – actually 3x ZDepth, each set up with different ranges so I could later choose the one that was best suitable. For the post-production I used Photoshop and Lightroom. 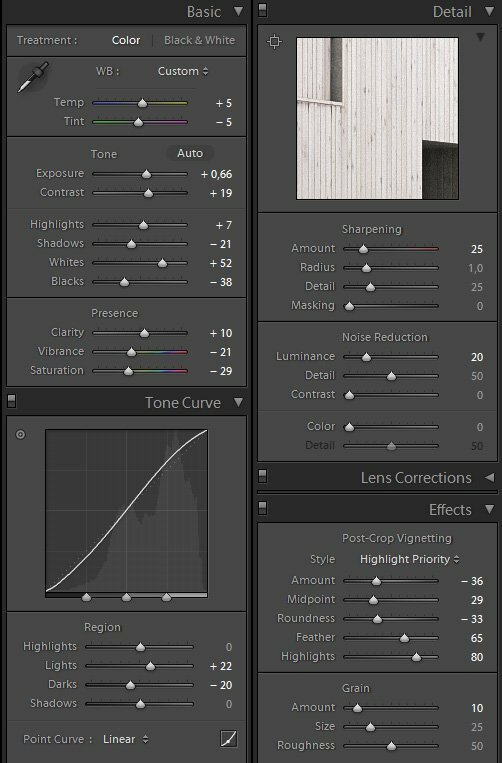 I could easily do all the work in Photoshop alone, but I really like the intuitive and non-destructive workflow of Lightroom. I use it exclusively for interior visualization, since there is rarely need for composting 2d images into the rendered picture. Below there are few stages of post work done in Photoshop. 2. 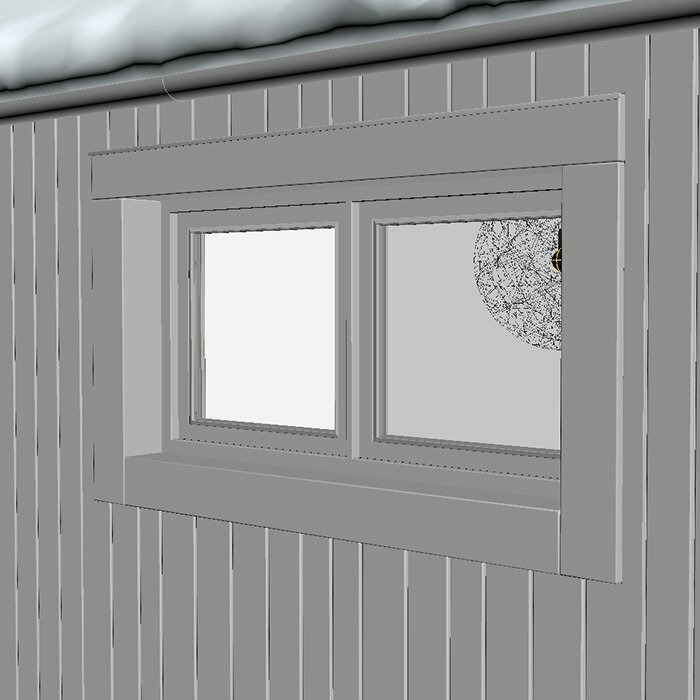 Facade dirt and extra knots for planking (after all the renders were finished I realized that the texture I’d chosen was way to “perfect” so instead of re-rendering all the images I added some more knots from 2d texture). 5. Z-depth blur and some hand painted highlights added to the mountains in the background. As you can see the image was still dull and lacked contrast. But the pass compositing and “matte painting” (huge overstatement here, but I can’t think of better term) was finished and the render was ready to receive final touches in Lightroom. 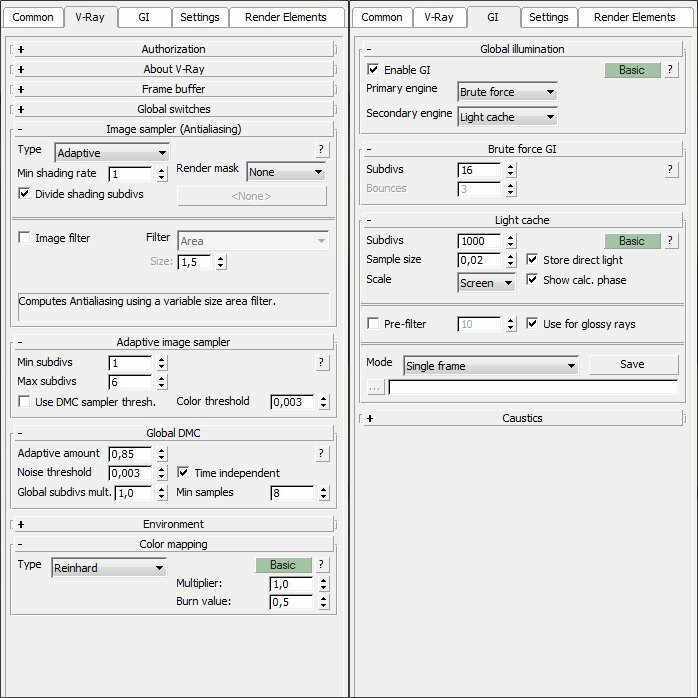 Here are the settings I used for all the renders I made. That’s all! I hope you enjoyed this making of and found it helpful. Here are four final images I created for this project. I encourage you to leave a comment. Please write did you like this article. Or maybe you have other ideas and suggestions?